Wauseon senior Jordan Sloan singles in a softball sectional final match-up with Napoleon back in May. Sloan received second team all-district honors in Division II. While the 2015 softball season may be complete, the awards season is not done yet. The latest accolades given out were the all-district teams in Division II. 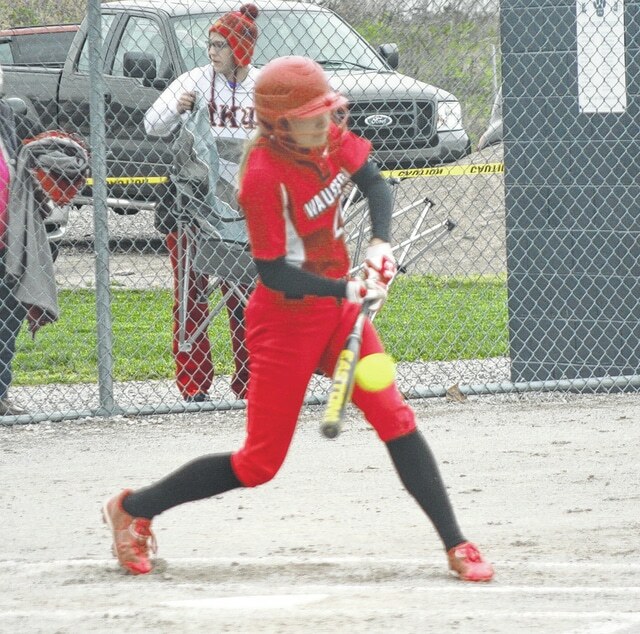 In the county, Wauseon senior outfielder Jordan Sloan was named second team all-district. She was one of three NWOAL players to receive all-district honors in Division II. Pitchers: Emily Lipstraw, Perkins; Abby Sgro, Lexington; Alyssa Windau, Shawnee. Catchers: Julia Miller, Bath; Carly Santoro, Bellevue; Kayla Wulf, Maumee. Infielders: Kennadie Goth, Shelby; Chelsea Imus, Edison; Alyssa Manley, Bath; Taylor Reiger, Napoleon; Alexa Schmeltz, Eastwood; Gabby Stoll, Edison. Outfielders: Taylor Cook, Clear Fork; Megan Ewing, Norwalk; Danielle Moore, Napoleon; Erica Moore, Fostoria; Sophia Pressler, Bellevue. Pitchers: Morgan Andrews, Bellevue; Michaela Black, Elida; Melody Fisher, Wapakoneta. Catchers: Callie Vogel, Celina; Chloe Wohlgamuth, Shawnee; Morgan Ziegler, Lexington. Infielders: Mackenzie Albright, Eastwood; Ellie Dackin, Bath; Kara Dienstberger, Bath; Evyn Kachenmeister, Maumee; Sabrina Kline, Elida; Kirsten Zink, Lake. Outfielders: Jordan Sloan, Wauseon; Kaylee Makin, Elida; Courtney Pelham, Norwalk; Allison Plasencio, Central Catholic; Grace Voigt, Bryan. Pitchers: Brooklyn Miller, Defiance; Erica Reber, Edison; Trista Savage, Bryan. Catchers: Blasia Moyler, Wapakoneta; Alexus Smith, Fostoria; Camryn Zehner, Shelby. Infielders: Madalyn Fidler, Shelby; Krista Jennings, Eastwood; Heidi Marshall, Clyde; Lyndsey Seamon, Bellevue; Emily Weaver, Edison; Alexis Zacharias, Celina. Outfielders: Cassie Best, Bath; Jamse Fullon, Shawnee; Kaitlyn Gonyer, Fostoria; Brooke Steinbrunner, Celina; Tiggie Sanabria, Edison; Caroline Turner, Defiance.